On March 31 2010, Madonna’s former manager, Caresse Henry, passed away at the age of 44. Her death was later ruled a suicide. Caresse had initially worked as an assistant to Madonna’s former manager, Freddy DeMann, before becoming Madonna’s personal assistant. When Madonna parted ways with DeMann in 1997, Caresse took the reigns as Madonna’s manager and remained in the role until late 2004. Caresse had also managed the careers of Ricky Martin, Jessica Simpson, Paula Abdul and Joss Stone, among others. Caresse was credited as an artistic manager and executive producer for the HBO special: Madonna: Drowned World Tour 2001. Liz Rosenberg (Madonna’s publicist at the time) released a statement to the press explaining that Caresse died of a self-inflicted gunshot at her home in Irvine, California. She was survived by her two children, a sister, a brother and her parents. For the first time in eight years since The Girlie Show, Madonna promises to take the stage live in a extensive international concert tour this summer. The exhilarating itinerary promises to take her in a series of shows in Europe beginning in June and all across America starting in July. The tour will be promoted by SFX. A complete schedule of these landmark events will be announced within weeks. Madonna is expected to perform material from her smash hit electrifying Cowboy Punk album Music as well as signature songs spanning the length of her incredible stunning career in a cutting edge concert setting that will continue the tradition of trend setting innovation that Madonna is famous and known for on the stage! On March 29 1999, Nothing Really Matters peaked at #7 on the Canadian Top 100 Singles chart (RPM). Warner Music Canada issued Nothing Really Matters as a CD maxi-single and as a two-track CD single featuring the b-side, To Have And Not Hold. While their U.S. counterparts were housed in “FLP” and “draw pack” sleeves, in Canada standard jewel cases with inserts were used for both configurations. On March 28, 2001, Madonna began filming the BMW commercial Star in Los Angeles, California, co-starring Clive Owen and directed by Guy Ritchie. Star was part of a series of short films (called The Hire) produced to promote BMW. On March 27 1993, Bad Girl peaked at #20 on the Canadian Top 100 Singles chart (RPM). 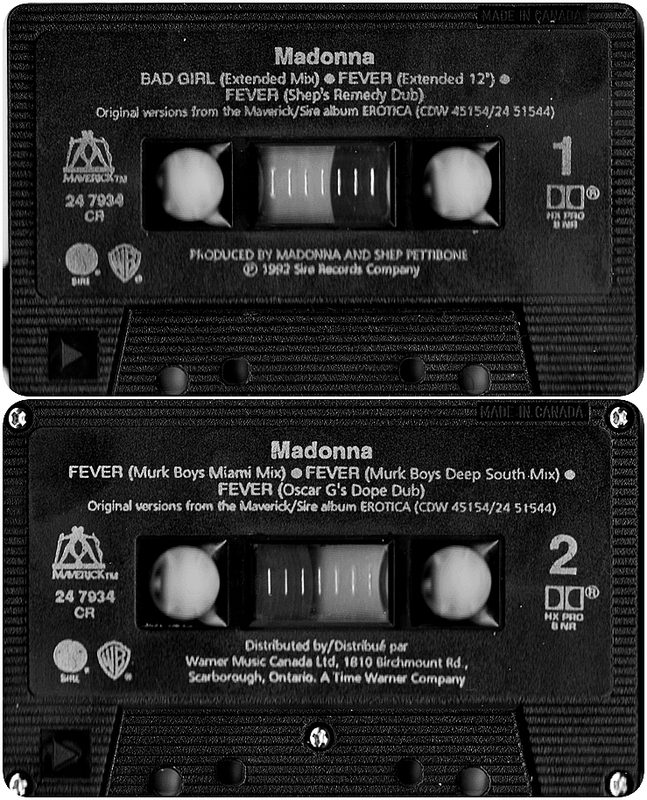 Although the single fared better in Canada than it did south of the border (it peaked at #36 on the Hot 100), Bad Girl nevertheless earned the undesirable distinction of being Madonna’s lowest charting Canadian single since Borderline at the time, which had peaked at #25 in September, 1984. On March 26 2009, Madonna’s I Am Because We Are documentary premiered online via YouTube and Hulu. The documentary was directed by Nathan Rissman and narrated by Madonna. I Am Because We Are depicts a journey in the second poorest country in the world, Malawi. In a country of 12 million people, so many children without parents has caused irreparable damage. The film attempts to explore what is going on in the heads and hearts of these orphans, and what the future holds for them. Suffering from AIDS, infections and malnutrition, most of the children in Malawi are in need for food, medical care, but also for proper education and guidance. More than just a story about Malawi, I Am Because We Are provides the audience with keys to help changing the situation but also spreads hope for a better world. On March 25 2008, Madonna’s 4 Minutes was made available for digital download. The lead single from Hard Candy featured vocals by Justin Timberlake and Timbaland.